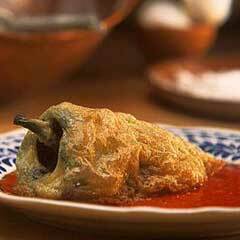 Learn all the tricks to making a great chile relleno. Allow yourself a little extra time the first time you make it, but after that it will seem easy. Make sure you have all the tools and ingredients assembled first. Make a slit in each chile near the stem and remove most of the seeds. Insert cheese stick and carefully close opening in chile pod by overlapping one cut edge over the other. Roll first in egg, then in cornmeal, being careful to keep cheese enclosed in pod. Let rest for 20-25 minutes. Heat oil in pan. When hot, place chiles in pan and let brown on each side, about a minute or so per side. Remove, use paper towel to soak up extra oil. Salt generously while hot.